I feel like I have neglected this little blog. When school was in session, I felt an urgent need to write about all of my stresses, challenges, and small successes, but could not find the time. Now that it is summer break, I have the time, but the urgency to write passed as well. The best way to get back in the habit is to just to do it, right? I can't promise thoughtful or insightful, but I can post lots of cleaning pictures. My attention has turned almost completely to the house. Marian is watching an obscene amount of television while I desperately try to get the house cleaned and organized over the summer. We are eating out way too much because my brain does not seem to have room for meal planning at the moment. It is what it is. In the midst of the focus on the house, we have enjoyed a housekeeping fiasco of my own making. The drama has been well-documented on the book of Face, but I'd thought I'd share here because A Post! Pretend this is a before picture. I know I've taken a picture of the laundry room, but I can't find it anywhere. 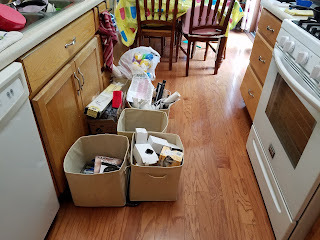 Way back about a month ago, my mother and I cleaned my beleaguered and ignored laundry room. 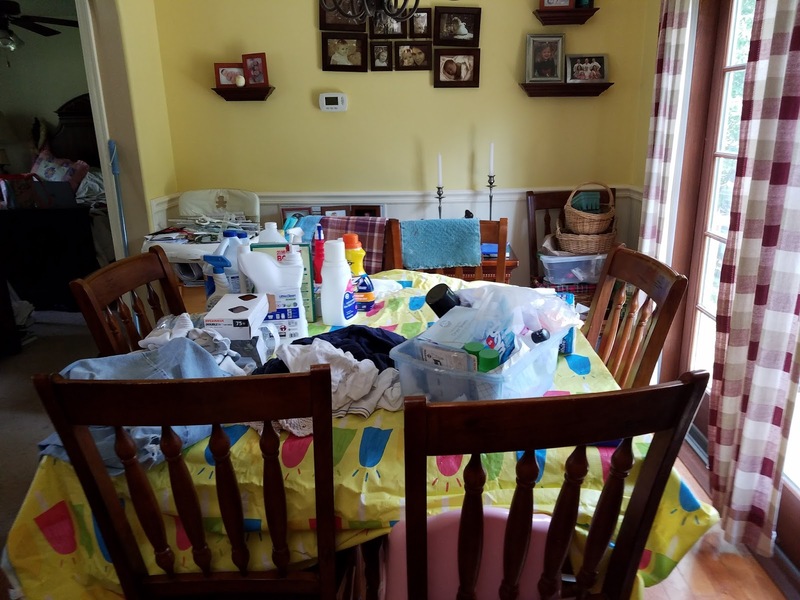 In the sorting, I found a cheap, plastic, flannel-backed tablecloth. It was dirty. I had a choice. I could attempt to clean it or throw it away. 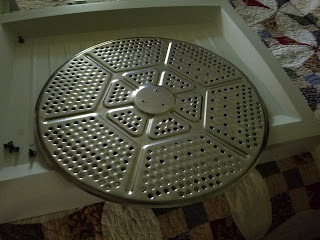 Well, I am a thrifty soul who hates throwing away useful things, but I did not want to hand scrub a $3 tablecloth. I decided to run it through the washing machine on gentle and see what happened. It survived the washer slightly worse for wear, but still serviceable. Since I am not a stupid person, I knew putting this object in the dryer on heat to dry would be a bad idea. I transferred the tablecloth into the dryer and set it for no heat and 60 minutes. Sixty minutes elapses. I check the tablecloth and find it is still slightly damp. Now I am not stupid. I just want to repeat this and make it clear. Since I am busy and trying to get the laundry done, I think to myself that I am not really interested in waiting another 30-60 minutes for this thing to spin on fluff. 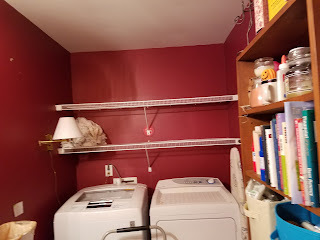 I, very reasonably!, think that if I put the dryer on low heat for about five minutes, it would finish off the drying project without risk and I could move on. FIVE MINUTES! LOW HEAT! So maybe it wasn't a good idea. Thus begins the task of rescuing the dryer. First I spent many hours scrubbing the dryer. 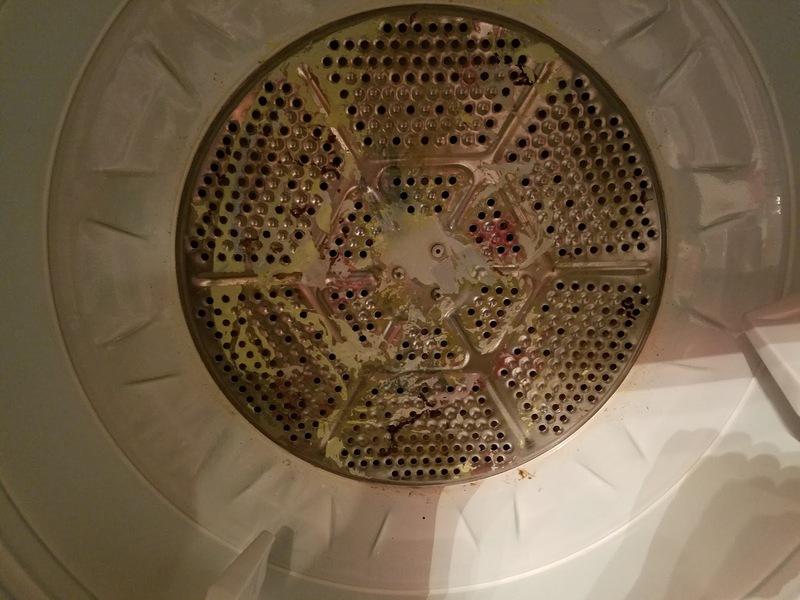 I learned that if I heated the dryer to soften the plastic, I could squirt rubbing alcohol onto the hot metal and get some of the melted plastic to break free. Yes, I lived in fear of catching myself on fire. Is this a good analogy of mortal sin? Yes, I knew what I was doing. Yes, I did it anyway. 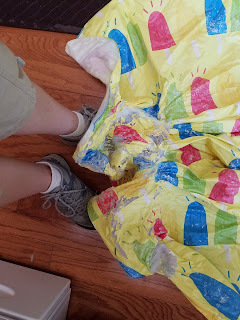 Since most of the remains of the tablecloth were in the very back of the dryer, it was difficult to reach. After several days of trying to reach all the way back there, Dave decided it would be easier if he took out the back drum cover so I could scrub it within my easy reach. Now I had to change techniques. Now I heated the metal with a hair dryer. Hurrah. 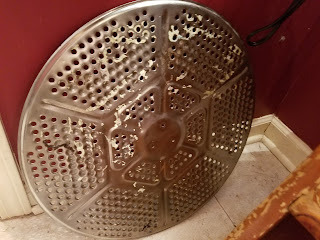 After scrubbing for hours and hours--you can't imagine how many TV shows Marian watched--I get the drum cover about as clean as I am willing to work on it. We attempt to screw the cover back into the dryer. It is at this moment we discover the axle that holds this entire puppy together has fallen into the bottom of the dryer. Well. This means the entire dryer has to be dissembled in order to get it back into working order. We make a decision. What if my cleaning job is not good enough? What if we take apart the entire dryer, put it back together, and discover with our test load that more work needs to be done? This is the end of the insanity. 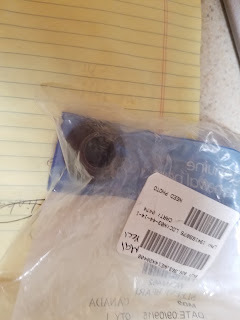 We find the replacement part is less than $20. If we had looked up the part on day one of this misadventure, I wouldn't have spent all day, everyday for nearly a whole week scrubbing this thing. A week of my life is worth $20. We decided to order a fresh part and wait. I take all of our laundry to my sister's house and spend a day doing laundry there. Thus ends the first week. No, we did not order the wrong part. Yes, this is what they sent instead. The first call to the company was fruitless because the recording told us to call back during business hours, which end at 11PM CDT. It was 9:30PM CDT. Yes, I know. The second call, during business hours this time--the business part of the business hours, I guess--was more productive. We got the part re-ordered except only one warehouse carried it and that warehouse did not have expedited shipping. It would be another week. I brought all of our laundry to my MIL's house and spent an entire day doing laundry. Thus ended the second week. We can begin the dryer surgery. 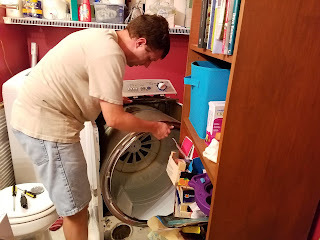 Dave, gallantly ignoring my nervous nattering, bravely deconstructs the dryer. 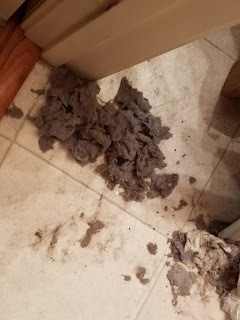 While Dave worked, I cleaned lint out of every possible crevice. He gets it apart. He puts it back together. We bravely turn it on. And it makes a weird noise, we haven't heard before. We turn it off. Maybe we need to get a professional involved. The children were set to visit my parents the next day. I load up all our laundry and spend an entire day doing laundry at my parents' house. Thus ends the third week. While I was at my parents' house, my father mentioned that he has taken apart and reconstructed dryers several times in his lifetime and he would be willing to look at ours. He was due to bring Marian home after her short version of the grandparent visit. A couple days later, they arrive. Daddy walks into the laundry room, plugs up the machine, and turns it on. He declares there is not a thing wrong with it. The noise that disturbed us was just a result of the drum being disturbed from its eight year resting place. He said after a load or two, it would all be fine. Hurray! Hurray! Do we have access to the laundry again? 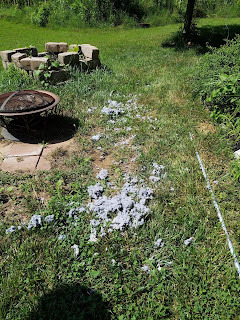 With all this pushing and shoving of the dryer around, we ended up tearing up the aluminum flexible tube that connects the dryer to the vent pipe. We needed a new one. After a trip to the store, Dave crawls under the house to replace the aluminum tube with some higher quality flexible metal piping. And he discovers the vent pipe is totally clogged with lint. 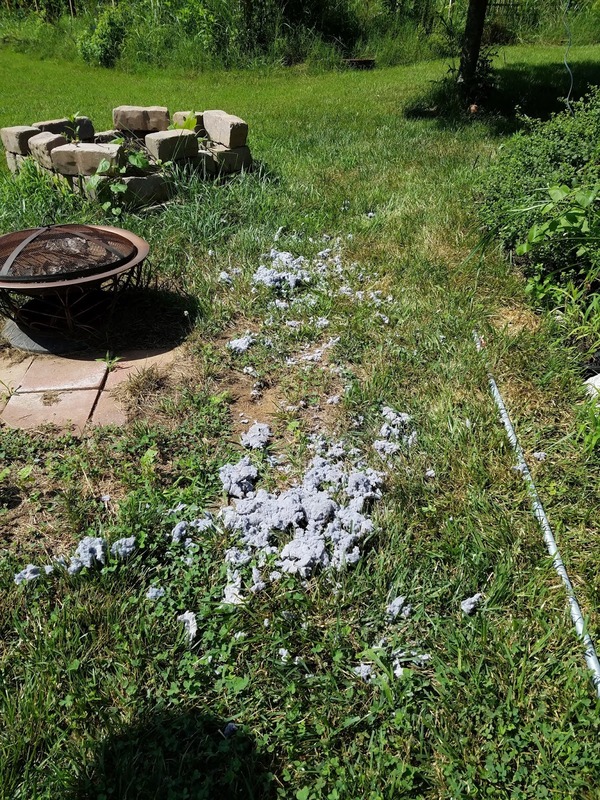 He pulls the entire tubing out from under the house and begins cleaning out the entire 15 foot length of it. In the process, one of the tube segments breaks. We are now in the middle of the fourth week. 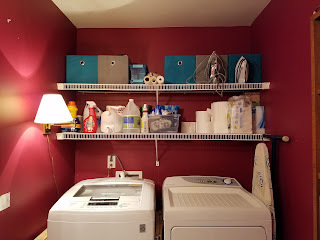 Tonight, Dave will go back to the store and buy a few more supplies and I expect we will have a functional laundry room by the end of the night. What started out as a five minute lapse of judgement has turned into a month-long trial that has cost us nearly $100 and a whole host of lost hours. But, by gum, we will have the cleanest, most well-ventilated eight-year-old dryer in the history of eight-year-old dryers by the time we are finished! Keep your fingers crossed that nothing else breaks. We have towels for miles that need washed. PS: Why don't I blog more? This little post took over three hours. Maybe I can find a way to work more quickly? I'll try to be more regular.